Yokai Watch is incredibly popular in Japan. The anime, the toys, and the 3DS games are all smash hits. They are the biggest thing going at the moment. So, you know if McDonald's rolls out a Yokai Watch Happy Meal, then that's going to be popular, too. 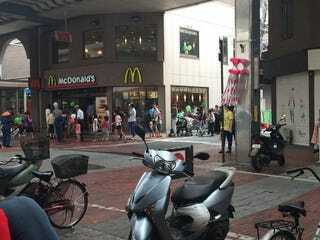 As noted by Buzz News Japan, the recently launched Yokai Watch Happy Meal is drawing long lines at local McDonald's across the country. However, do be aware that McDonald's also has an Aikatsu! Happy Meal, too, and Aikatsu! is also incredibly popular anime and card game. The Happy Meals contain kiddy arcade cards for either Yokai Watch or Aikatsu!, and per usual, McDonald's Japan has Happy Meal toys "for boys" and "for girls." But since seemingly every kid in the country seems to be into Yokai Watch, it's not popular to make those gender divisions. The assumption from Buzz News Japan and numerous Japanese Twitter users is that everyone is waiting for Yokai Watch Happy Meals—an assumption that anyone with kids in Japan would most definitely have. The amazing thing about this is that, until the Yokai Watch Happy Meal, a meat scandal had negatively impacted McDonald's Japan, which was importing questionable meat from China. I'm really curious to see if Yokai Watch's tremendous popularity will go global like Pokemon's did.